YakGear Brand Ambassador Chris Castro was born in Corpus Christi, Texas, but lived much of his early life overseas. As he traveled from Spain to France and on to England, fishing was always near – and the hobby developed into an early passion. Upon returning to the United States in 1992, he found himself far from the ocean, and searching for creative ways to enjoy his pastime. Passion for kayak fishing came on strong in 2012, and after three years of paddling he decided to create a fishing show of his own. 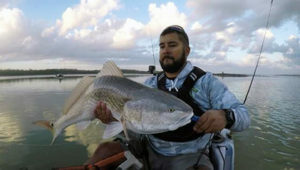 He truly believes that kayak fishing is next-level fishing, and so began his journey of filming fishing adventures. In 2015, Next Level Fishing TV launched on YouTube. His passion gained notice in 2016, when YakAngler.com awarded him Video of the Year. Today, Chris is president of Next Level Productions and is working with Careco Entertainment and the Pursuit Channel to produce a national television show based on kayak fishing adventures.